Does your little one drool a lot? Or maybe you just like to dress your baby in style. Either way our bandanna bibs can fit your needs. These stylish bibs are backed in fleece to help keep those shirts dry. Fits most from 4 months to 2 years. If you're a busy mom like me changing shirts and having extra laundry only adds to your work. 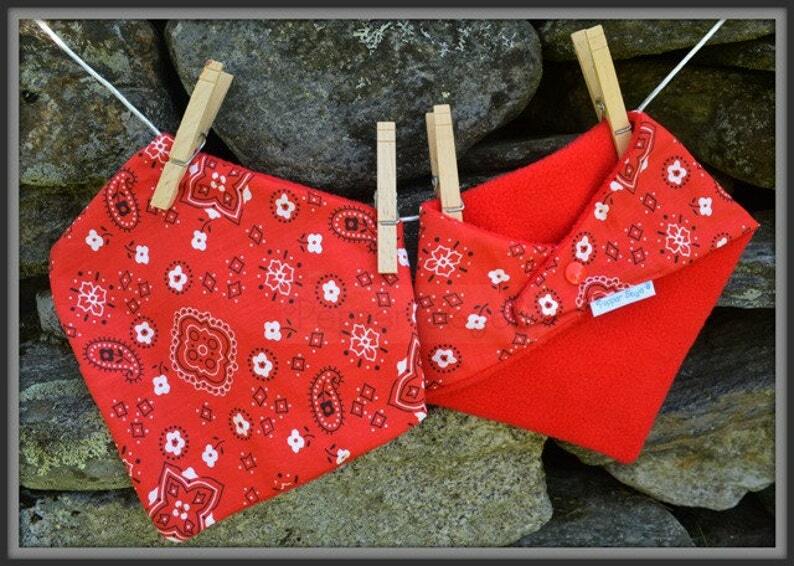 So get your bandanna bib from Pepper Skye today! Our one and only bandanna bib that looks like a bandanna! Great for a touch of style or to add to costumes. Backed in red fleece and has a matching plastic snap. Machine wash warm or cold. Like colors recommended for the first few washes. Toss in the dryer or line dry. If you receive an item that is damaged or defective you need to send the item back to us to receive a refund or a new item. There are no refunds for items shipped to wrong addresses, for items lost in the mail that didn't have tracking/insurance or items damaged after use. Only regular priced items may be refunded, unfortunately clearance/discontinued items cannot be refunded. We only replace items if they are defective or damaged. If you need to exchange it for the same item, send us an email at exchanges@pepperskye.com and send your item to: 315 Main Street, Rumney, New Hampshire, 03266, US. If you are shipping an item over $50, you should consider using tracking or purchasing shipping insurance. We don’t guarantee that we will receive your returned item. Ready to ship items ordered from PepperSkyeBaby usually ship 1-3 business days after your order is received. Custom orders take 1-2 weeks depending on availability & shipping time for material. Manufacturing time can vary depending on sales volume and availability of fabrics from our suppliers. Our delivery charges are based on each weight and location. Orders are shipped via UPS, FedEx or USPS. We will ship internationally. Insurance and tracking are extra so please make sure to add it if you'd like it. If you need a custom order done in a shorter time frame you can pay a rush fee and/or for overnight shipping. To ensure proper delivery, please provide accurate and complete shipping address information including street address and suite or apartment number, where applicable. We will not refund for items sent to wrong addresses. So, you like our bibs? We'd love for you to sell them for us in your store, where ever that may be. We can take wholesale orders, from 10 to 20 to hundreds of items. Wholesale orders are handled directly via e-mail. Once your order is arranged, the items will be produced and shipped as soon as possible. Usually 2 to 4 weeks depending on the size of the order and availability of fabrics. Contact us at info@pepperskye.com for more information or to place an order.